St. Anthony Parish is dedicated to the patronage of St. Anthony the Hermit (251-c.356), also known as St. Anthony of Egypt. He is considered to be the founder of Christian monasticism. He was born in Coma, Egypt to wealthy parents. His parents died when he was a young man leaving him a large inheritance. 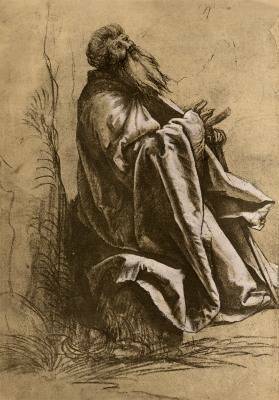 Not long after his parent's death he heard at Mass the Lord's instructions in the Gospel to "go, sell what you have, give to the poor, and thou shalt have treasure in heaven." He divided his inheritance among the poor and retired to a mountain cave on the east bank of the Nile living as a hermit for about 20 years. He emerged to organize monastic life for the crowds who followed him. He again retired to the desert lying between the Nile and the Red Sea and lived for 45 years on the mountain where stands the monastery named for him, Der Mar Antonios. He died in the area of Mount Colzin, near the Red Sea. The monks have never revealed his place of burial. He was admired for his meekness. He is often pictured with a pig. Some believe Satan took the form of a pig to torment the hermit. Others believe he was a healer and probably used an ointment made from pig skin. He is the patron of Hospitallers, domestic animals, butchers, brush-makers, basket-makers, grave-diggers, and graveyards. He is called to invoke against pestilence, epilepsy, erysipelas, and skin-diseases. His symbols include: tau-shaped cross (Saint Anthony's cross), small bell, hermit, pig, book. The Catholic Church celebrates his feast January 17.